What do you need to know when making withdrawals from a Roth IRA? When does a withdrawal constitute a taxable event? And when does a withdrawal generate a penalty? These are great questions, because being informed can help you to avoid unnecessary and costly mistakes. Understanding these basic concepts will put you ahead of most people when it comes to understanding Roth IRA withdrawals. Before you can withdraw any investment gains or conversion and rollover contributions, you must first withdraw all of your original contributions. For instance, let's say you're 60 years old, and you're ready to start making regular withdrawals from your Roth IRA. You have a total of $300,000 in your account, which is composed of $25,000 in annual contributions, $75,000 in conversion funds, and $200,000 in investment gains. If you withdraw $25,000 per year, you would withdraw all of your original contributions in year one, all of your conversion funds in years two through four, and the remaining funds in years five and beyond. So why does this matter? Are those funds treated differently? For example, your original Roth IRA contributions can always be withdrawn tax-free and penalty-free regardless of your age or how long you've had your account. But rollovers, conversions, and investment gains are a different story. For instance, in the above example, even though you're older than age 59 ½, you need to keep in mind that each rollover or conversion must independently meet the requirements of the Roth IRA 5 year rule. So if you made a conversion two years prior to withdrawing your conversion funds, you still haven't met the requirements of the 5 year rule, and that means any withdrawal of conversion funds from your Roth IRA will be slapped with a 10% early withdrawal penalty. So make sure you familiarize yourself with all the rules regarding withdrawals from a Roth IRA before you start making withdrawals. After all, the whole point of having a Roth IRA is to shelter your retirement savings from taxes! If done right, withdrawals from a Roth IRA are tax-free and penalty-free. That's the big difference between a Roth IRA and other traditional retirement accounts such as a 401k or a Traditional IRA. The first rule is self-explanatory. The second rule requires you to open AND fund your Roth IRA at least 5 tax years prior to making a withdrawal of rollovers, conversions, or investment gains. For instance, let's say you open and fund a Roth IRA in 2013. When will you meet the requirements of the 5 year rule? Because five tax years will have passed - 2013, 2014, 2015, 2016, and 2017. That means in 2018 and beyond, you're in compliance with the 5 year rule (although make sure you keep in mind that each rollover or conversion you perform must independently meet the requirements of the 5 year rule. So what happens if you aren't in compliance with the two aforementioned rules? Well, as long as you only withdraw you original principal contributions, nothing. Those are always free of taxes and penalties. But if you withdraw rollover funds, conversion funds, or investment gains without first meeting the two conditions, then you'll probably owe income taxes as well as a 10% early withdrawal penalty! As a general rule, withdrawals from a Roth IRA which are made prior to age 59 ½ or prior to meeting the provisions of the 5 year rule are considered early withdrawals. And most early withdrawals trigger a 10% early withdrawal penalty. Now, keep in mind that the early withdrawal penalty only applies to the early withdrawal of rollover funds, conversion funds, or investment gains - not original contributions. For instance, let's say you're 38 years old. You have $10,000 in your Roth IRA - $5,000 in annual contributions and $5,000 in investment gains. If you make a $5,000 withdrawal, IRS rules require you to withdraw all of your original contributions first. So you'll owe nothing in taxes or penalties. However, if you withdraw an additional $5,000, you'll owe income taxes as well as a 10% early withdrawal penalty. Because investment gains withdrawn prior to age 59 ½ are subject to income taxes and a 10% early withdrawal penalty. So before making withdrawals from a Roth IRA, make sure you're well informed of the potential consequences. 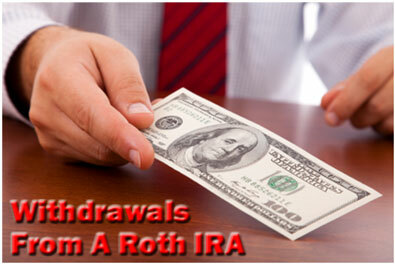 Forced Withdrawals From Your Roth IRA? One thing you never have to worry about is forced withdrawals from a Roth IRA. Well, if you have a Traditional IRA, the IRS requires to start making withdrawals at age 70 ½. But what if you don't need the money then? Wouldn't you be better off allowing those funds to continue growing tax free for when you do need them? Of course you would, and that's one of the great advantages of a Roth IRA. With your Roth IRA, you don't have to worry about forced withdrawals because there isn't an established arbitrary age at which you must make withdrawals. Withdrawals from a Roth IRA can be tax-free and penalty-free if you follow the rules. First, original contribution withdrawals are always tax-free and penalty-free. Next, to withdraw rollover funds, conversion funds, or investment gains tax-free and penalty-free, you must first reach age 59 ½ AND meet the requirements of the 5 year rule. And last, make sure you understand that each rollover or conversion must independently meet the requirements of the 5 year rule before you can make tax-free, penalty-free withdrawals. Knowing these rules can help you avoid unnecessary taxes and penalties, saving you a lot of time, money, and heartache. So know them! Check out our new Facebook Page and follow us on Twitter! Read 5 Reasons Why I Love My Roth IRA, our part in the Good Financial Cents Roth IRA Movement! Start planning ahead for next year by checking out 2017 Roth IRA contribution limits, and stay alert to this year's changes to the 2016 Roth IRA contribution limits. 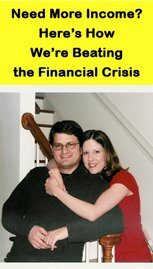 Our family fully funds our Roth IRA with this website. Learn how you can do it too. Read more about what's new on the Roth IRA blog. Hi, I'm Britt, and this is my wife, Jen. Welcome to our Roth IRA information website! This is our humble attempt to turn a passion for personal finance into the Web's #1 resource for Roth IRA information. But, believe it or not, this site is more than just a hobby. It's a real business that provides a stable and steady stream of income for our family. In fact, because of this site, Jen is able to be a full-time stay-at-home mom and spend more time with our daughter, Samantha. But you want to know the best part? ...You can do the same thing! Anyone with a hobby or a passion (even with no previous experience building a website) can create a profitable site that generates extra income. If you're tired of solely depending on your job(s) for family income, click here now and learn why our income is increasing despite the financial crisis and how we're making our dreams come true. Best Roth IRA Brokers Roth IRA Calculators Roth IRA Interviews Investing Books Investment Research Site Build It! The information contained in Your Roth IRA is for general information purposes only and does not constitute professional financial advice. Please contact an independent financial professional when seeking advice regarding your specific financial situation. Our family started this site as a labor of love in February 2009, a few months after our daughter was born. Thank you for helping it become one of the most visited Roth IRA information sites. Thank you, too, to the "SBI!" software that made it all possible. We hope you find what you're looking for and wish you much continued success in your retirement planning!